When Carl and Sue decide to escape their busy lives and head to a resort for the weekend, they could not have predicted the next three days that would follow. Writer and director Pat Kiely tells the often hilarious, but ultimately heartbreaking story of the young couple and their incredibly dysfunctional three night stand. 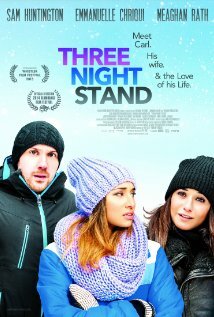 Three Night Stand starts off as a normal indie comedy. Jokes flying around left and right with quick wit and a sense of improvisation to them. Carl (Sam Huntington) and Sue (Meaghan Rath) appear happy, but desire a break from their everyday lives, hence the getaway. Unbeknownst to Sue, Carl planned to take her to the resort that he and his former co-worker and lover, Robyn (Emmanuelle Chriqui), spent many nights at. Also hidden from Sue is Carl's secret obsession with Robyn. In a cruel twist of fate for the married couple, Carl and Robyn are eye to eye once more as it turns out she is the owner of the resort. Past feelings emerge for the former lovers and new secrets pop up for Carl and Sue. From check-in on, Carl and Sue's weekend, and lives, unravel rapidly. Joined by an underage superstar French actor, two of Carl's current co-workers, and Robyn's livid soon-to-be ex-husband, the stress free weekend that was supposed to be is anything but and the consequences of everyone's actions are brought to light as the film turns from a comedy into a dramatic piece. Highly recommended as a film that may be looked at originally as a goofy late night comedy. A little film that pleasantly surprises and delivers on every level. Certainly not a masterpiece by any stretch of the imagination, but a good film for a lazy Sunday perhaps.